“Chin Chin” played at the Grand Opera House in Canton, Ohio on April 1st. It is not clear if they played anywhere on April 2nd or 3rd, but the cast and crew arrived to perform at the Liberty Theatre at Camp Sherman, (Chillicothe) Ohio on April 4th, 1920. Even though the show was on a military base, advertising was like most cities that the show went to. I have been unable to find base papers, handbills, or programs, so all I have seen came from the Chillicothe Gazette, the nearby town’s newspaper. 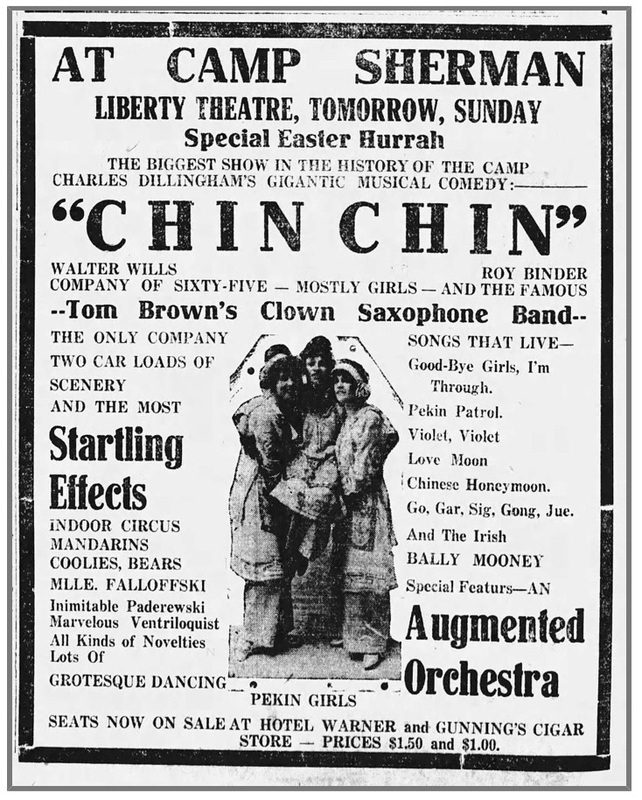 There was a typical “Chin-Chin” advertisement showing Walter Wills and Roy Binder about five days before the show. Long thin column ads ran on April 1st and 2nd mentioning that the show sold out in many locations before and those that want to see the show should get their tickets right away. There were no reviews nor was there any after show information regarding the show. A massive construction program created by the War Department resulted in the simultaneous nation-wide construction of 16 new National Army cantonments and 16 new Army National Guard training camps. Approximately 5,000 workers had arrived by 5 July 1917, and construction started the next day. [ii] During the war construction never ended. There were 13 contracts for building during the war and there was constant expansion until Armistice Day. Besides barracks, the Camp included 11 YMCA buildings and three theaters. Two for motion pictures and one building, the Liberty Theatre, that could do both motion pictures and live shows. The theater was completed by December 1917. Most sources I have found indicate it had a seating capacity of 1,300 people,[iii] however, the Julius Cahn – Gus Hill 1922 Supplement indicates the seating capacity was 2,500. All agree that it was managed by a civilian. 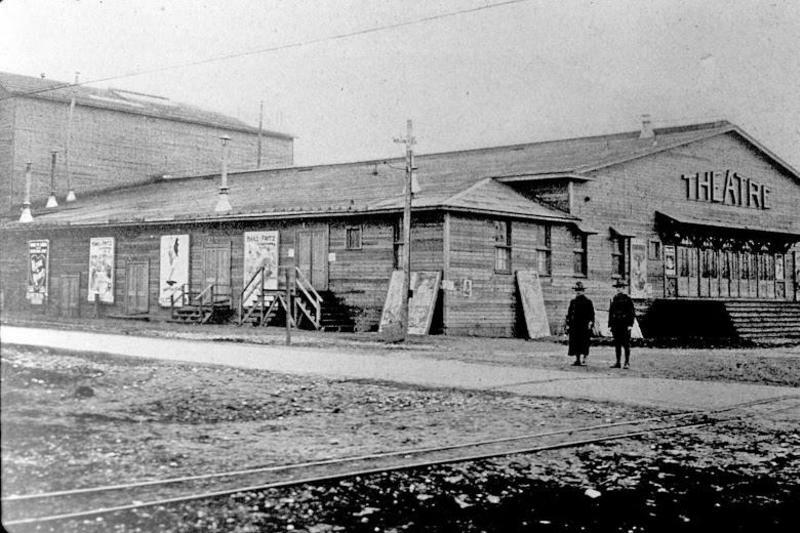 Most of the Camp’s buildings were demolished during the 1920s. 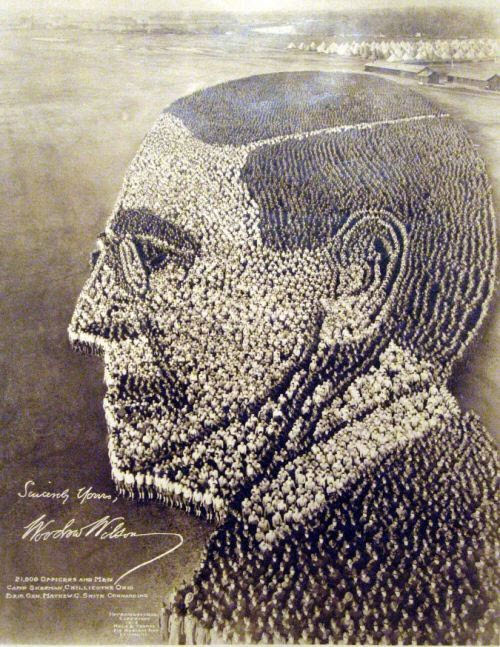 Image of Woodrow Wilson created by 21,000 officers and men. Camp Sherman 1918. Photo: Public Domain via Library of Congress. Camp Sherman is particularly well known for a formation they did consisting of 21,000 troops that formed an image of Woodrow Wilson. It is one of those truly amazing Great War photos. The next day, the “Chin Chin” cast and crew played 150 miles north of Chillicothe at the Sandusky Theater in Sandusky, Ohio. [iii] History of the Ohio State University – Volume IV, The University in the Great War, Part III, In the Camps and at the Front by Wilbur H. Siebert.